Marine biologists from New Zealand are now thawing out the largest dead squid ever found. As of now, nobody has seen a living, fully-grown colossal squid, or Mesonychoteuthis hamiltoni, in its natural habitat, which is very deep in the ocean. Colossal squid are not to be confused with giant squid, as the former are much larger and found furthers south, in Antarctic waters. 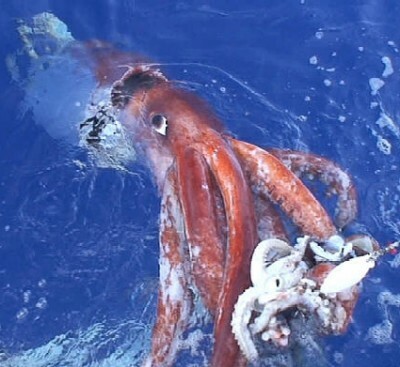 The squid that was found weighs 1,089 pounds and is 26 feet long. It was caught by fishermen and was frozen until science teams could thaw and observe it. The scientists plan to learn more about the squid’s anatomy, diet (by removing the stomach), and reproductive cycles. The colossal squid are some of the least studies residents of the deep ocean waters. It is projected that they can grow up to 46 feet long. The problem to study them is reaching where they live. Giant squid can dive down to 6,500 feet. It is also a rather aggressive animal, which often gets into life-or-death fights with whales.